Are leaking ducts costing you more than you think? Are some of the rooms in your home warm while others are cold? Unsealed ducts account for as much as 30% of your total heating and cooling costs. 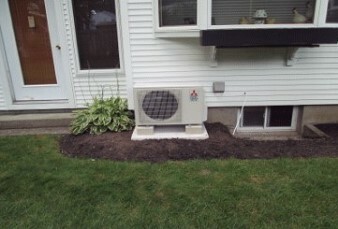 Boucher Energy Systems has been installing central air conditioning systems since 1981. Years ago, conventional, large duct systems were about the only type of central air conditioning systems that were available to homeowners. Today, however, the choices have increased. We are proud to offer world class, innovative options for air conditioning your home. A split system heat pump is a year-round comfort system. In the summer it draws heat out of your home to keep it cool, and in the winter it draws heat from outside air into your home to keep it warm. Many heat pump installations have a booster electrical resistance heater that automatically supplements heat brought in from the outside. Boucher Energy Systems, Inc. has been designing hydro air systems for over 25 years. 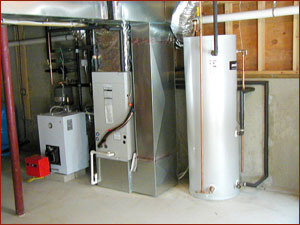 A hydro air system is a combination of a hot water and a hot air system. A hot water boiler, either oil or gas fired, generates heat. The water is then pumped through small diameter tubing to an air handler unit. Carbon monoxide is an odorless gas that causes thousands of deaths each year. It is a chemical produced from the incomplete burning of natural gas or other products containing carbon. When you breathe in carbon monoxide, the carbon monoxide gas replaces the oxygen in your bloodstream. Boucher Energy Systems, Inc. is a Mitsubishi Electric Diamond Contractor. This means we have reached the highest level of accreditation, training, and hands-on expertise from Mitsubishi Electric Cooling & Heating. Only Diamond Contractors can offer the 12 & 12 Warranty Program. This program offers a twelve-year warranty on compressors and twelve years on parts. Boucher Energy Systems, Inc. has installed radiant heat for over 25 years. Radiant heat uses warm water- generally from 80 degrees to 140 degrees – and is circulated through flexible, durable PEX tubing embedded in the floor. The floor radiates warmth to the walls and objects in the room. As these objects become warm, you experience less heat loss because you’re standing next to warm objects.... and you feel warm and comfortable. Boucher Energy Systems, Inc. has been installing solar thermal systems for over 30 years! Solar thermal systems use solar to heat your water. The solar thermal panels absorb solar energy. Solar fluid is circulated through the panels by a low-energy pump that delivers heat to a water storage tank. Boucher Energy Systems offers our customers only the very best in the steam systems. Peerless is an excellent cast iron boiler and is price competitive with other American boilers. It is our first choice for a steam boiler, which is an area of the market that Viessmann does not operate in.